Heading into the league opener against Molalla, North Marion was fresh off of a low-scoring defeat of non-league foe Seaside. Against one of the better teams in the Tri-Valley Conference (TVC), the Huskies had something to prove, and boy, did they. North Marion picked up the first league win of the season 53-44 in Molalla on Wednesday, Jan. 16. "I was proud of the girls, I thought they played a good game," Molalla head coach Phil Wiesner said of his squad. "We just lost a few focus moments and had a few mental lapses, and it makes the difference in the game, especially playing against a good team like that." The win was not easy though. While the teams began the contest point for point, Molalla pulled ahead early in the first quarter. Baskets from senior Samara Nacoste and sophomore Kaityn Curry gave the home team a 12-7 advantage at one point. Though North Marion would use opportunities from the free throw line to take a brief lead 13-12, Molalla regained control of the scoreboard 15-14 to end the first eight minutes. "They shot well early on and outrebounded us big time in the first half," North Marion coach Trevor Bodine said. "I don't know what the stats were, but we just weren't getting the rebounds and loose balls and they were. They acted like they wanted it a little more than we did in the first half." In the second quarter, it was more of the same. 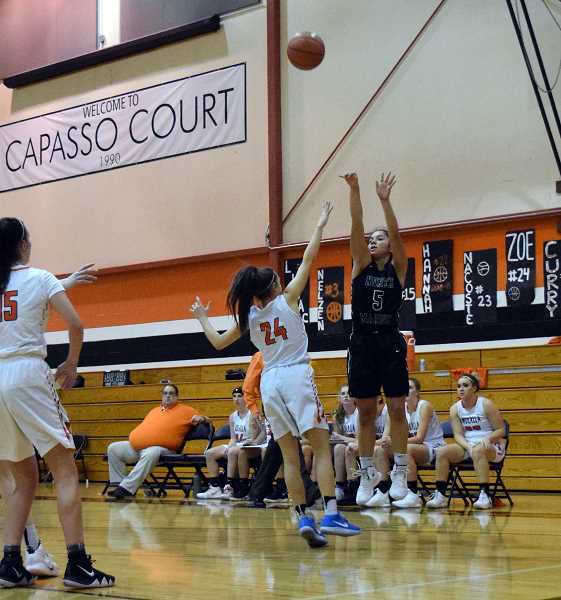 Molalla's Nacoste came up big for the home team in the early portion of the second quarter, getting points from the charity stripe and battling her way inside the paint for buckets there. Molalla had extend its advantage yet again, leading 21-17 at one point but the Huskies would not be deterred. "The majority of the game we put good pressure on them, and played good team basketball," Wiesner said. "On the offensive end, we played good team basketball and made them play defense. That was the key going in, making them play defensively." Sophomore Danielle Christenson picked up a steal and hit senior Mar Verastegui in transition for two points. Senior Raymee Boese picked up two points of her own and the game was tied 21-21. Molalla bounced back, taking advantage of trips to the free throw line, with sophomore Zoe Wood and senior Mattie Myers finishing the quarter with four straight points for the home team. At half, Molalla led 26-23. Coming out of the break North Marion found itself possessed with a renewed sense of urgency, something Molalla was unable to match. The away team attacked the rim, and found itself on a 11-4 run to start the third stanza. Christenson, Verastegui, and junior Katie Ensign all chipped in from inside the key (Ensign also nailing a long ball for 3-points). "We had a good talk at halftime, and they made a decision as to what they wanted to do," Bodine said. "We came out, played tougher 'D,' got the ball inside a little bit, made shots. That's been our problem all year is that we're not putting the ball in the basket like we should be. But it started to work a little in the third and fourth quarter." Molalla answered with baskets from junior Maedline Lisac, junior Audriahna Greer, and Curry, but North Marion's defensive pressure slowly began overwhelming the home team. Verastegui and sophomore Mya Hammack picked the pockets of Molalla offense as it made its way across the half court line. The turnovers set up four consecutive baskets for Hammack, who finished the game with 14 points and a handful of steals. "I feel like defense is really important," Hammack said. It's like Trevor says, 'Defense wins games.' I strive really hard to make sure my girl doesn't score, and I think Mar does the same thing." "I want (Mya) to attack," Bodine said of his guard. "Very few people in the state can guard her when she's one on one. She's quick, and has good handles." At the end of the third quarter, North Marion led 42-36. The fourth quarter was less pronounced than the third quarter for North Marion, but the result was the same. Defensive pressure led to a stymied Molalla attack, and the home team could not make up significant ground over the Huskie's eventual 9-point advantage. North Marion walked away with a 53-44 victory. Following that contest, North Marion picked up an impressive 60-41 victory over Madras on Friday, Jan. 18. The Huskies (2-0 in TVC, 11-5 overall) will face off with Estacada (0-2 in TVC, 2-14 overall) on Tuesday, Jan. 22. Molalla (1-1 in TVC, 9-7 overall) rebounded with a 56-34 win over the aforementioned Estacada Rangers, and will face Corbett (0-2 in TVC, 3-12 overall) on Tuesday, Jan. 22.